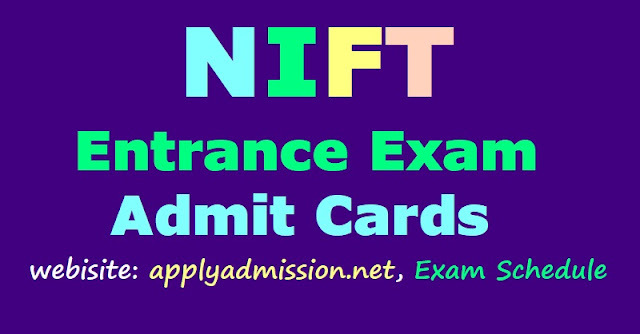 NIFT entrance exam 2018 Admit cards, NIFT PG Degree Entrance Exam 2018 admit cards, NIFT Entrance Exam Schedule 2018, National Institute Of Fashion Technology Admissions, NIFT Admissions: Admit card released at applyadmission.net for written test, exam on January 21. The admit card for the entrance examination 2018 has been released by the National Institute of Fashion Technology (NIFT) on the official website – applyadmissions.net. All those who had registered for the same are required to download their respective cards from the website itself. The written exam is being conducted for admissions to undergraduate (UG) and postgraduate (PG) programmes on January 21 at 32 cities. Through the exam, a candidate’s knowledge, skill and aptitude for the programme opted will be assessed. National Institute of Fashion Technology (NIFT) has released the admit card for admission to entrance exam. The admit card is available on the official site of NIFT at nift.ac.in. Candidates who will appear for the examination can check the official site and download the admit card. The written test will be conducted on January 20, 2019. Steps to Download NIFT Admit Card: Visit the official site of NIFT. The link for admit card for written test will be available on the homepage under Admissions 2019. Click on the link, a new window will open. Enter the application number, date of birth and email id for login. Download the admit card and take a print out of the same for further reference. The selection process encompass written examination followed by the situation test, group discussion and interview. The written exam result will be out in last week of February 2018 or March 2019. Admission will be done on the basis of marks scored on all the stages.